It’s a new year, which means it’s the perfect time to start planning for a productive and engaging second semester. Because formative assessment is most likely an essential practice in your classroom, WriteSteps has some tips to help you improve collecting formative assessments for the rest of the school year. 1. Create a cooperative, not a competitive, atmosphere. Help your students understand that you are all working together as a team. Many formative assessments are cooperative activities. 2. Focus on quality rather than quantity. Quality work and skill practice do not have to take long, and they can usually be done in the context of the lesson as opposed to an added-on work sheet. Remind your students that learning is a process. Help them set goals for improvement, and feel confident that they can meet them. 3. Don’t emphasize grading over learning. Your goal should be to see where you can adjust your instruction and help students master the content, not to collect a grade. 4. 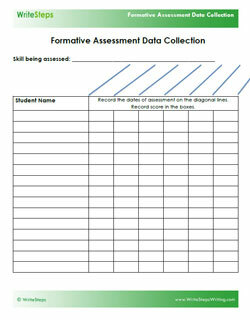 Keep a list of skills and a record of how your students are doing with our formative assessment data collection handout. Save time by re-teaching the most prevalent skills to your entire class, and see what the focus should be for individual student’s conferencing sessions. The Formative Assessment Data Collection handout helps you keep track of each student’s level of mastery of a particular skill. This record sheet will help you know if additional practice or conferencing is needed for individual students or for the majority of the class. 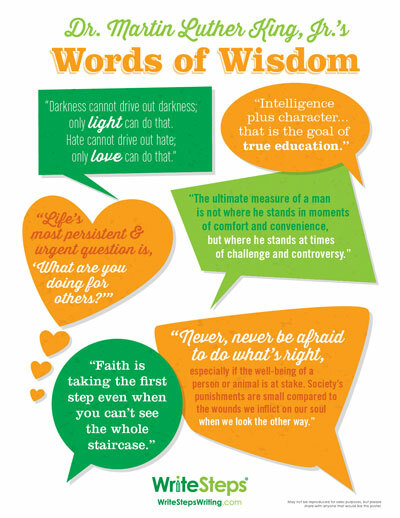 Much can be learned from leader Dr. Martin Luther King, Jr. The leadership lessons he gave the world are as important today as they were during Dr. King’s life. Amy Hunkapiller, a kindergarten teacher, shares how she helps her students remember to put spaces between words as they write. 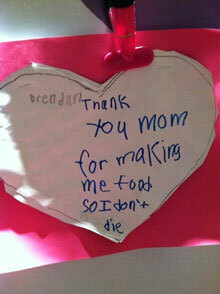 It’s the simple things that truly mean the most. Do you have a funny student writing piece you can send us? If so, send it to [email protected] to be featured in an upcoming eNewsletter! WriteSteps welcomes Lisa Leucht to the team! She is joining us as a professional development coach and will also be working with the curriculum development team. Lisa brings 16 years of elementary education experience to WriteSteps, along with curriculum and assessment designing experience at the county, state, and college levels. Lisa has a Bachelor of Science degree in Elementary Education from Wayne State University and a Master of Arts in Teaching from Marygrove College. 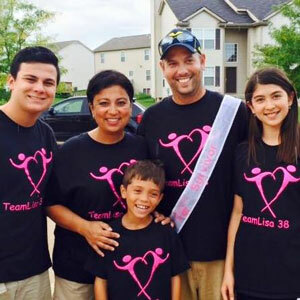 Lisa enjoys spending as much time as possible with her husband and three children. They attend all home University of Michigan football games together and have a two-year-old Yorkie-poo named Wheatley. Lisa also enjoys gardening and reading, and is one and a half years cancer free! Stop by the WriteSteps booth at the Georgia Association of Educational Leaders Conference and say hi to Awareness Ambassador Ashley McGukin. She will be able to answer any questions you have about WriteSteps. Ashley McGukin will be at the Georgia Charter Schools Conference. Stop by our booth to learn more about WriteSteps and enter to win a one-year subscription to eWriteSteps! Mitch Bonder will be at the New York Elementary Principals Association Conference located inside the Brooklyn Marriot. He will be there to answer any questions you have regarding our award-winning, K-5 writing and grammar program.